Posted: Thursday, June 28, 2018. 4:51 pm CST. By BBN Staff: Today, Vice President of the United States of America, Mike Pence arrived in Guatemala. 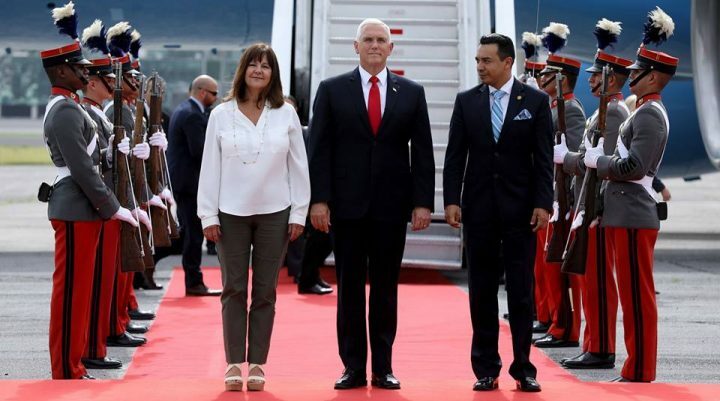 Pence is currently on a tour to Latin American countries including Ecuador, and Brazil. Pence met today with Guatemalan President Jimmy Morales, Salvadoran President Salvador Sanchez Ceren and Honduran President Juan Orlando Hernandez. The countries are home to many immigrants caught trying to enter into the United States of America illegally. Pence‘s visit and statements come amidst intense scrutiny of the Trump‘s administration‘s ‘zero tolerance‘ policy that led to the separation of many migrant families at their Southern border. The purpose of his trip to the country is focused on discussing immigration. Guatemala’s Presidential spokesman, Alfredo Brito said that Morales would reiterate Guatemala’s request for Temporary Protected Status for Guatemalans. While in Guatemala, Pence’s wife Karen met with victims of Guatemala’s Fuego Volcano that killed many people on June 3, and left over a million people displaced.